France and Germany are both outspoken in their criticisms of the inclusion of the Investor State Dispute Settlement mechanism in the ongoing trade talks with the US. The two countries are discussing throwing their combined weight behind a common position onthe matter. EURACTIV France reports. Paris and Berlin want the Investor State Dispute Settlement mechanism (ISDS) removed from in the transatlantic trade treaty currently being negotiated with Washington. Matthias Fekl, the French Secretary of State for Foreign Trade, told EURACTIV France that he would “never allow private tribunals in the pay of multinational companies to dictate the policies of sovereign states, particularly in certain domains like health and the environment”. Criticism of TTIP, particularly from France, has crystallised around ISDS. The mechanism is designed to protect investments by allowing recourse to arbitration tribunals in the event of a conflict between a private company and a government. “We believe the dispute settlement mechanism needs to be deeply scrutinised, but that does not mean we distrust the United States,” Fekl said. The German Environment Minister, Barbara Hendricks, told the German press she remains “sceptical about the Investor State Dispute Settlement mechanism,” which she believes is “simply not necessary”. The French government fears it may have to deal with “exorbitant demands” from large multinationals. This could threaten “the public finances and place an economic burden on citizens”, the Secretary of State explained. Examples exist, albeit in small number. Germany’s decision to stop using nuclear power gave rise to a complaint from Swedish energy company Vattenfall, whose legal action could cost the German government several billions euros in damages. This situation finds a particular resonance across the Rhine, in the context of the French government’s plan to reduce the country’s nuclear capacity over the coming years. Further afield, cigarette company Philip Morris launched a complaint against Australia in 2011, after the government adopted legislation forcing companies to sell cigarettes in unmarked packets. An arbitration tribunal is due to return its verdict on whether or not to award damages in 2015. Several options are being examined to try and make the dispute settlement system more palatable for the French. Firstly, the French government hopes to bring the national courts into the system and to reign in abuse of the mechanism by businesses, which, unlike the states themselves, are subject to no financial risk in the procedure. “We are thinking about the best way to sanction these abuses,” the minister said. The second possibility would be to establish an appeal system for arbitration tribunal decisions, which could be administered by an international organisation. Thirdly, the French demand increased procedural transparency, in order to ensure that members of the tribunal never find themselves simultaneously in the position of judge and defendant. Matthias Fekl said “it is common knowledge that there are enormous conflicts of interest in arbitration cases”. In France, an arbitration tribunal awarded 403 million euros in damages to the financier Bernard Tapie in the 2008 Adidas affair. One of the judges, Pierre Estoup, has since been investigated for fraud and organised crime, while Christine Lagarde, who was Minister for the Economy during the trial, was interviewed by the judges. French and German criticisms of ISDS were echoed across Europe on Tuesday 13 January, with the long-awaited publication of the public consultation on the protection of investments in the transatlantic trade pact. The consultation received 150,000 replies, largely from the United Kingdom and Germany, in which 88% of respondents said they were opposed to the Investor State Dispute Settlement mechanism. The European executive was forced to push the dossier to the end of the TTIP negotiations. EU member states have already begun the task of reviewing the TTIP negotiation mandate. “We are working [on these proposals] with our European partners,” said the French Secretary of State. “Germany’s positions are very close to our own, and I will be going to Berlin in the near future to discuss them,” he added. “If we manage to come to an agreement on precise proposals with Germany, I think we will have really made progress”. EURACTIV France understands that Denmark, Luxembourg, the Netherlands and Sweden also agree with at least some aspects of the French position. In June 2013, the European Union's heads of state and heads of government gave the Commission the responsibility for the free-trade negotiations between the EU and the United States. The European Commission is seeking agreement on a number of issues, including the protection of investments and the proposed mechanism of dispute settlement between investors and states. The guidelines stated that the EU should seek to include provisions on investment protection and investor-to-state dispute settlement (ISDS) in the proposed agreement. 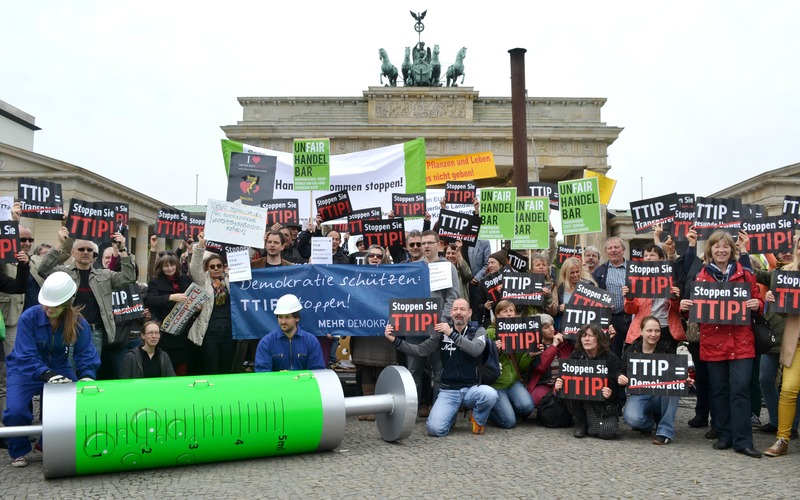 The EU executive consulted the public on its possible approach to investment protection and ISDS in the TTIP, asking whether the EU’s proposed approach for TTIP achieves the right balance between protecting investors and safeguarding the EU's right and ability to regulate in the public interest. This consultation was extended over the summer on account of the high interest and the Commission intends to publish a report in early 2015.